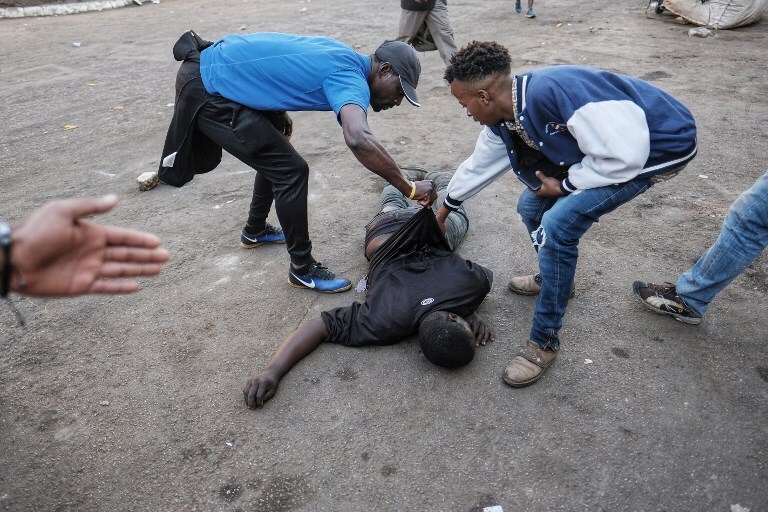 Protests in Zimbabwe against alleged election fraud turned bloody on Wednesday when soldiers opened fire and three people were killed, shaking hopes that the vote would mark a new era for the country. Soldiers fired live ammunition during opposition MDC party protests in downtown Harare, AFP witnesses saw, with one man shot dead in the stomach. Monday’s polls — the first since autocratic president Robert Mugabe was forced out by a brief military takeover in November — had been meant to turn the page on years of violence-marred elections and brutal repression of dissent. But the mood quickly descended into anger and chaos as supporters of the Movement for Democratic Change (MDC) opposition declared they were being cheated in the election count. Official results showed that the ruling ZANU-PF party had easily won most seats in the parliamentary ballot — strengthening President Emmerson Mnangagwa’s prospects of holding onto power in the key presidential race. MDC supporters, who say their leader Nelson Chamisa won the vote, burnt tyres and pulled down street signs as protests spread from the party headquarters in Harare. Police confirmed the death toll of three, and Mnangagwa issued a statement blaming the opposition for the unrest and fatalities. “We hold the opposition MDC Alliance and its whole leadership responsible for this disturbance of national peace,” he said, adding the government “went out of its way” to try to ensure the elections were peaceful. The United States embassy called for security forces “to use restraint in dispersing protesters”, saying it was “deeply concerned by events” in the Zimbabwean capital. Mnangagwa, 75, had promised a free and fair vote after the military ushered him to power in November when Mugabe was forced to resign. A credible and peaceful vote was meant to end Zimbabwe’s international isolation and draw in foreign investment to revive the shattered economy. The MDC, which accuses the election authorities of falsifying results, said the army had opened fire “for no apparent reason” leading to the deaths of unarmed civilians. European Union observers had earlier declared they found an “un-level playing field and lack of trust” in the election process. It called for transparency in the release of results. “On many occasions — preparation, financing, media and hopefully not in the counting — it was advantageous for the ruling party,” EU chief observer Elmar Brok told AFP. Under Mugabe’s 37-year reign, elections were often marred by fraud and deadly violence, with European Union observers banned since 2002. The Zimbabwe Electoral Commission (ZEC) said Wednesday that of 210 parliamentary seats, 205 had been counted with ZANU-PF winning 144 and the MDC Alliance 61. “The results are biased, trying to give the impression that ZANU has won,” said Lawrence Maguranyi, 21, an MDC supporter and university student protesting at the party headquarters. MDC leader Nelson Chamisa, 40, said the presidential results were fraudulent. “We have won this one together. No amount of results manipulation will alter your will,” he tweeted before the army were deployed. The electoral commission warned that final results of the presidential first round may not be known until Friday or Saturday. Commission chairwoman Priscilla Chigumba, a high court judge, has flatly denied allegations of bias and strongly disputed accusations of rigging. Mugabe, 94, voted in Harare on Monday alongside his wife Grace after he stunned observers by calling for voters to reject ZANU-PF, his former party. His attempts to position Grace as his successor are widely thought to have driven the military to intervene and put their favoured candidate, Mnangagwa, in power. Mnangagwa, Mugabe’s former right-hand man, was the clear election front-runner, benefitting from tacit military support and control of state resources. But Chamisa, a lawyer and pastor who performed strongly on the campaign trail, sought to tap into the youth and urban vote. He has repeatedly accused ZANU-PF and election authorities of trying to use a flawed electoral register and fixed ballot papers to steal the election. Mnangagwa was allegedly involved in violence and intimidation during the 2008 elections when then opposition leader Morgan Tsvangirai pulled out of the run-off after attacks claimed the lives of at least 200 of his supporters.